Steven Berke, who has been to the Pine Ridge Reservation in SD, organized a car wash two years in a row! 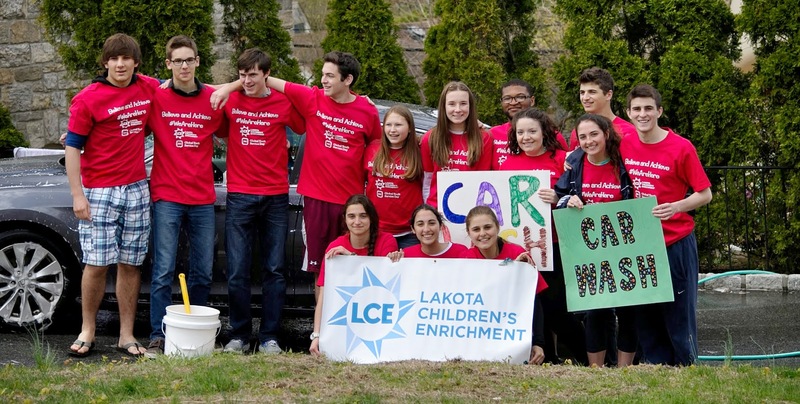 For the second year in a row, on April 26, 2015 Scarsdale High School Junior Steven Berke organized and ran a Car Wash to raise money for Lakota Children’s Enrichment. 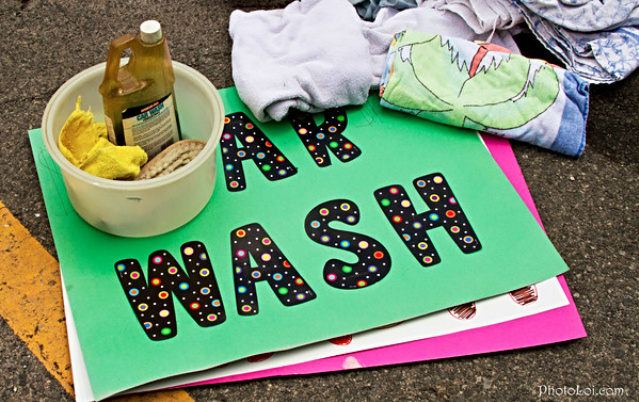 This was the fourth year that Scarsdale Congregational Church’s Youth Action Committee (YAC) — a group of teens from across the county who meet monthly to engage in service activities — participated in a Car Wash to benefit Lakota Children’s Enrichment. Steven brought together a team of about 20 car washers of all ages, including YAC members as well as volunteers from surrounding communities who read about the event on Facebook. Three elementary school girls from White Plains heard about the car wash and washed through both shifts! They said they had “so much fun” working for a good cause on a Sunday afternoon — they all want to start LCE Clubs at their respective schools — we’ll let you know how that goes! The YAC team and others rolled up their sleeves, got drenched for the cause and in less than two hours, with two shifts of enthusiastic washers cleaning at three stations, they raised over $800. Steven Berke has a personal commitment to the community. He visited the Pine Ridge Reservation in SD as a freshman in High School on a service trip with YAC. He said, “I saw the daily hardships that the people living there had to endure, and it really hit me how much they needed help. As soon as I heard about the opportunity to run the car wash at the Scarsdale Congregational Church to benefit the Lakota, I immediately volunteered. This was my second year doing the car wash… and the atmosphere was absolutely wonderful. It was amazing how hard people worked, and the turnout was great!” Steven said he looks forward to being “more involved” and to an even more successful event next year! Maggie Dunne and the LCE team just returned from a week-long celebration of Native Youth Voices and arts on the Pine Ridge Reservation in South Dakota and were on hand to help with the car wash, to show off artwork and other items from Pine Ridge and to answer questions. As a Lead Agency for Youth Service America’s Global Youth Service Day, LCE produced a celebration of arts, expression and service that spanned from Rapid City SD, to Allen SD, to Kyle SD, to Pine Ridge SD, to Rockyford SD … and then concluded by helping at the YAC car wash in Scarsdale NY. The first shift of YAC volunteers who washed cars! Scarsdale has a long-standing relationship with Pine Ridge: LCE was founded by Scarsdale resident Maggie Dunne, 24, when she was a student at Scarsdale High School; the Youth Action Committee makes bi-annual trips to Pine Ridge; The Scarsdale Insurance Agency on Scarsdale Avenue provides LCE with pro bono office space for its headquarters; The Scarsdale Rotary Club named LCE one of the five permanent beneficiaries of its annual fundraising; and Scarsdale STEP hosted a student from Pine Ridge, and will welcome another when LCE Youth Board Vice Chair Summer Montileaux arrives in the Fall of 2015. Steven Berke is the incoming President of the STEP Club at Scarsdale High School and the Berke family currently hosts STEP student Robert Lee. Robert will graduate from Scarsdale High School in June, and will enter Vanderbilt University in the fall of 2015.